My son like this set...so I like it too! Effortlessly enhance the look of your bedroom with the VCNY Beckham 8-piece Bed in a Bag set. This set features a soft polyester construction with an ikat pattern in grey, blue and white that is sure to complement your decor. Didn't see that it was made out of polyester. The sheets pilled in less than a week and the comforter retains heat a little too well for us in California. The white sheets also had a slight blue tint to them. We had to buy all new sheets and only kept the shams, bedskirt, and comforter. Which is a bummer, considering the price of the set. The set itself matched my room décor perfectly; however, I did not like that the sheets were green. This made no sense to me because the color scheme of the set is blue, black, white, and grey. However, the sheets were very soft although I will not use them with the set. I use this on my bed. I love it! Just the right weight. It has beautiful detail and quality. The sheets that come with it though aren't great but then again, I didn't buy it for the sheets. The blue is deep blue jay blue. Very nice! Love this bedding!! Got it for my spare room. Guest say it's comfortable and very nice looking. The sheets seem like decant quality. The comforter is light weight but perfect for a smaller blanket under the comforter. This set if very nice ! the sheets are very soft and the comforter is very warm. very good quality. Beautiful design. Comforter and pillow shsms is of good quality although sheets and pillow cases were of lesser grade, somewhat thin. The comforter set is very beautiful. Looks very elegant. 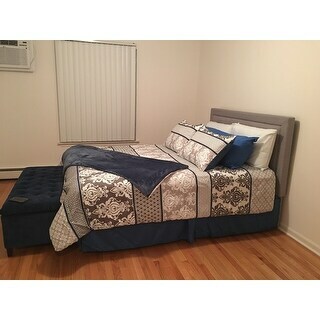 Comforter is excellent quality and is so soft. I want more made like this. I feel like I am sleeping underneath a soft fluffy pillow! As described and super cute! I really did like the bedspread. It’s color was even better than I expected. The quality of material has held up to several wash cycles and drying. I love it and have had several compliments. Purchased for my guest room.